A truly unique and modern creation by Julian Stephens Goldsmith crafted from Sterling Silver and 18ct White Gold to create a personal and stylish version of the classic men’s signet ring. 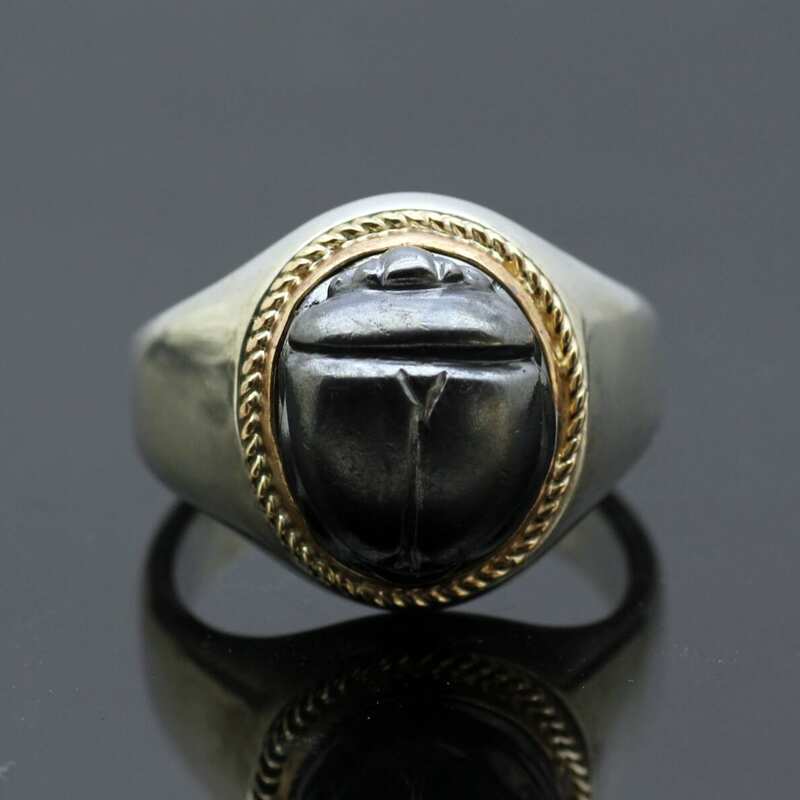 This contemporary mens ring is created from a sleek, solid Sterling Silver shank with a classic 18ct Yellow Gold twisted rope pattern frame to surround the eye-catching and beautiful Scarab beetle design to create a one of a kind centrepiece. 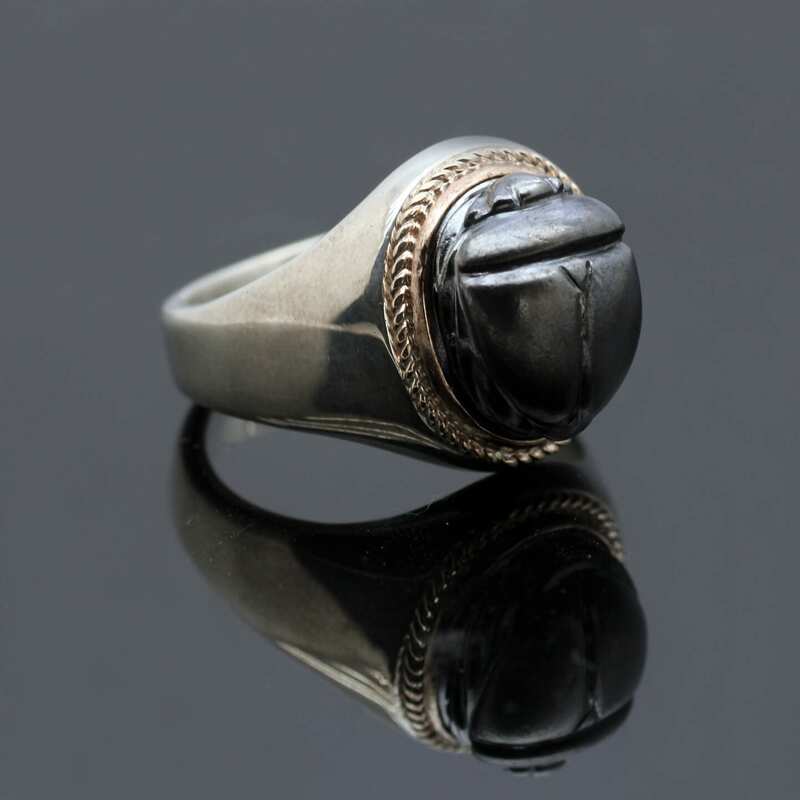 The beautiful Scarab beetle motif has been hand carved, cast in solid Sterling Silver and finally is hand finished by oxidising the Silver to create the darker, contrasting tone and is hand polished to create the smooth, tactile texture. This exquisite bespoke hand crafted signet ring has been meticulously hand crafted by our master Goldsmith Julian Stephens from his Brighton workshop and proudly bears his exclusive makers mark and Hallmarks as an indication of its thoughtful design, quality materials and execution. To discuss a unique commission piece and make your ideas a beautiful reality please contact us by email, telephone or pop in to our Brighton boutique for more details.